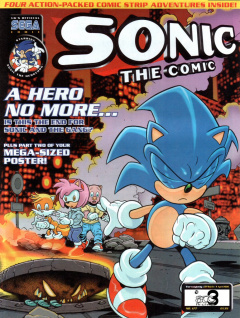 Sonic the Comic #177 is the one-hundred and seventy-seventh issue of the Sonic the Comic series by Fleetway Editions Ltd. Following immedately after the events of the last issue, the Freedom Fighters are mourning the death of Johnny Lightfoot, except for Sonic, who refuses to accept it. It appears that Johnny has come back to life, before swirling away in a sea of pink and turning into Amy, who reveals that Sonic was dreaming in his room. Sonic has slipped into a sea of melancholy and is blaming himself solely for Johnny's death. Amy tries talking some sense into the disheartened hero, but Sonic blows her off, saying he has been risking everyone's lives for years without thinking of the consequences, and knows what must be done. Graphic Zone: Fan art submitted by readers. The theme for this issue's Graphic Zone is "Sonic and the Gang! ", featuring pictures of the Freedom Fighters and Knuckles. Owners of the printed art each won a Sonic the Hedgehog digital watch. Two of the entries in this issue's Graphic Zone did not provide the artists' names or addresses. The second part of a mega-sized Sonic poster.